He announced on Saturday that he will speak at the Iowa Democratic partys annual gala, a key event for activists in the first state to hold presidential nominating contests. 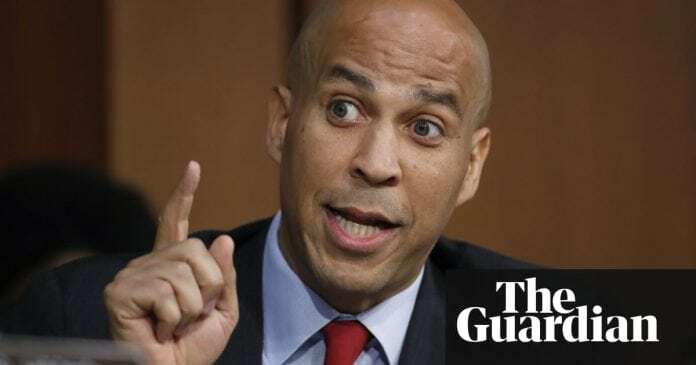 Among the candidates whom Booker is aiding are Rob Sand, a former state assistant attorney general recently profiled in the New York Times, and Deirdre DeJear, who would be the first woman of color elected to statewide office in Iowa. The senator is assisting Democratic efforts to regain control of the state legislature and raising money for Democratic candidates and progressive causes across the state. Booker is not the only prominent Democrat with staff active in Iowa. Montana governor Steve Bullock has placed a staffer with Tim Gannon, the Democratic nominee for state agriculture secretary, and both Ohio congressman Tim Ryan and Oregon senator Jeff Merkley have operatives on the ground. The Maryland congressman John Delaney, who has officially announced a presidential bid, has stumped with innumerable local candidates. Others are making more subtle moves. The California senator Kamala Harris is hosting a Washington fundraiser for DeJear on 11 September. That event will be co-hosted by Ro Khanna, a California congressman who has visited Iowa twice in recent months on behalf of Democratic congressional candidates. Placing staffers on campaigns is a time-tested way for potential presidential candidates to test the waters in early-voting states while building necessary political infrastructure. But it is not a guarantee of a White House run. In 2006, Evan Bayh, then a senator from Indiana, and Russ Feingold, then a Wisconsin senator, paid for staffers to work on campaigns in Iowa. Both decided against presidential campaigns. Bookers speech will be his second address to Iowa Democrats. The former mayor of Newark spoke to the state delegation in the 2016 Democratic National Convention in Philadelphia, receiving a warm reception as he boasted of family ties to the Hawkeye state. In the midterm election cycle, he has been a fixture on the stump. This weekend he was campaigning in Texas. Last year, he was one of few national Democrats to campaign for Doug Jones, who won a special election for US Senate in Alabama.